Though I have been closely following L'Affaire Ngabo from the time, Tsering Woeser mentioned it for the first time on her blog (in Chinese), I refrained to write about it. A couple of weeks after Woeser's first posting, an English translation was available on the site High Peaks Pure Air. Now that the issue has come up in the Indian media (see The Hindu's article below), I feel that I should pen (on the keyboard) some of my thoughts. My question is therefore why taking a side on Ngabo's dismissal when Ngabo remains silent. It is also rarely mentioned, but Jigme Ngabo is the son of Ngawang Jigme Ngabo, who worked closely with the Chinese since the beginning of the 'liberation' (invasion) of Tibet. 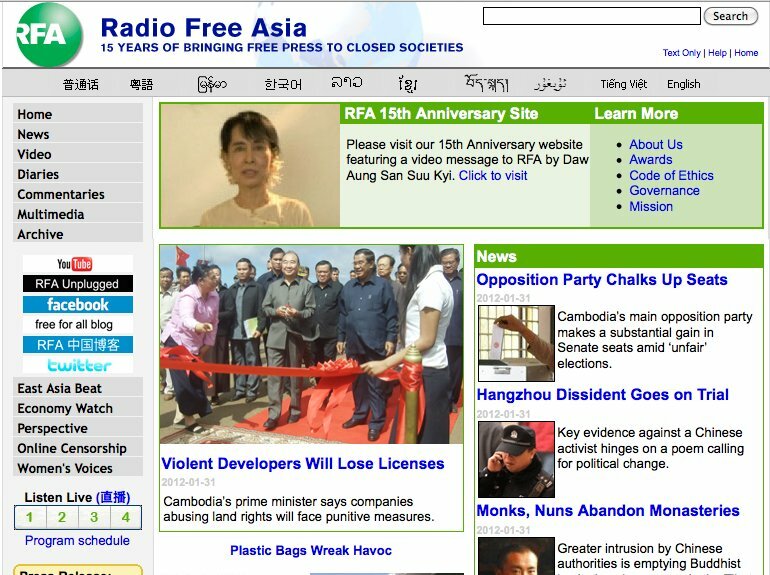 Or while in RFA's, has Ngabo walked on someone's foot in the Tibetan Establishment? It is possible, but one can only speculate in the current opaque atmosphere. First and foremost nobody asked: who is benefiting the 'crime'? It has been demonstrated that Dharamsala's political stand is not accepted by all Tibetans in the Diaspora (and in Tibet, where nobody immolate itself for the Middle Path). My article The only solution for Tibet issue appeared in the DNA today. The Dalai Lama is in town. I was to travel to Bangalore when I heard that the Dalai Lama would be in the city for 2 days. Immediately, I thought I should try to have his Darshan; the easiest way was to attend his lecture on ‘science and religion’ held at the Christ University. The 2000-seat Auditorium which was packed to the brim suddenly went silent as he began talking. The Tibetan leader started with a small survey. He asked how many in the auditorium were less than 20-years old; very few arms went up. Then, between 20 and 25, most of the hands were up. He continued, above 60? A few honorable professors, acknowledged their seniority. Then, he lifted his arm to indicate that he was more than 70. A couple of ‘senior’ members of the faculty and the Vice-Chancellor admitted being in the last category. He started laughing and said: “the world does not belong to us, because we belong to the past century; most of the present problems (he particularly cited environmental issues) have been created during the past century by us, ‘old people’; it is up to you to now rectify these predicaments. He continued: “The 21st century belongs to you, it is your duty to change the world; do not think that your lonely voice can’t do anything; you should and can do it”. Once again, he cited environment pollution, corruption, violence, hatred or social inequality as the main issues to ‘change’. He insisted that change it can only happen through love, compassion and understanding of the ‘others’. He told the audience an anecdote: one day, a Cuban refugee came to see him and told him that she was a Christian and everyday she was praying that Fidel Castro should depart from this world; but in her prayer, she requested the Lord to find a place for the Leader Maximo in Paradise. It was the correct way, explained the Dalai Lama; “you should pray that even your enemy’s life ends peacefully”. The ever-increasing popularity of the Tibetan leader in India and abroad raises the issue of the situation in his homeland. One can’t stop thinking: what would happen if the Dalai Lama was allowed to return to Tibet (even for a brief visit)? 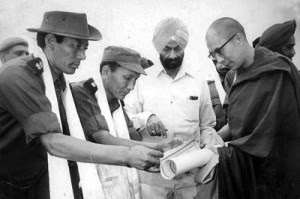 One still has in mind the riotous scenes when 3 fact-finding delegations from Dharamsala visited Tibet in 1979-1980. Huge crowds assembled wherever they went, even in the most remote nomadic areas; they surrounded the delegates to get a close darshan of the envoys of the ‘living god’ (or more rightly, the incarnation of Avalokiteshvara, the Bodhisattva of Compassion); the hair of the poor delegates were pulled to be kept as relics, their chubas (Tibetan traditional dress) were torn; local nomads ate the dust of the tyres of the envoys’ vehicles as prasad. Considering that most of the 85 Tibetans who have immolated themselves, left notes before their fatal gesture asking for their leader’s return, one can imagine what would happen in Tibet. At the same time, the Dalai Lama is the only leader which can stop Tibet burning and China disintegrating. How many in the Politburo realize this? Perhaps, the soon-to-be President Xi Jinping does; but will he be able to take along his colleagues on the reconciliation ‘middle path’? Some probably still think in terms of using yet more force to repress the ‘restive minorities’? But has force worked since 1959? Is there then a realistic solution? Yes, Xi Jinping, whose father Xi Zhongxun knew the Dalai Lama well in the 1950’s and early 1960’s, should personally meet the Tibetan leader in a Chinese (or Indian) embassy abroad and have a preliminary discussion with the Dalai Lama to prepare a road map to stop the immolations and bring about a genuine reconciliation between Tibet and China. Over a thousand students in Chabcha county in Tsolho prefecture took to the streets Monday morning around 6 am to call for equality of nationalities, freedom of language, investigation of present situations and respect for truth. 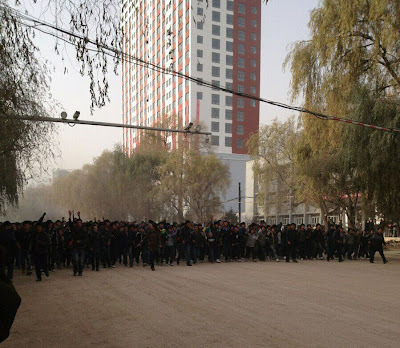 The protest by Chabcha Tibetan Medical School students lasted for about two hours before Chinese personnel used severe force to break the peaceful demonstration, injuring many students. The school is under complete lock-down and severe restriction. 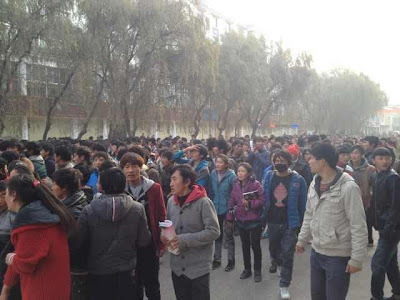 Today's mass student protest is known to have triggered by distribution of sheets by Chinese authorities that denounced the self-immolations as foolish separatist actions, questioning the meaning of such actions. 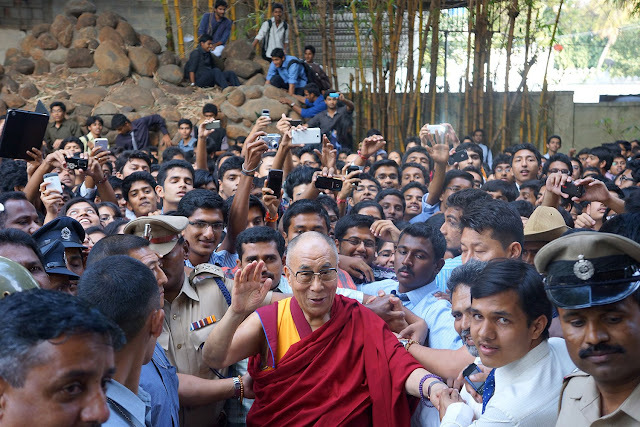 Thousands of Tibetan students at Sorig Lobling medical school in Chabcha (Ch: Gonghe) protested against the distribution of a ten-point political questionnaire and accompanying “patriotic education” sessions that contained disparaging remarks against the Tibetan spiritual leader, His Holiness the Dalai Lama. On 26 November, at around 9 am (local time), the protest erupted after the ten-point questionnaires were distributed among the students at the medical school in Chabcha town of Serchen County in Tsolho (Ch: Hainan) Tibetan Autonomous Prefecture, Qinghai Province. The questionnaire required students to fill up answers to ten questions such as “What is the nature of self-immolation?” and "What are the consequences of illegal demonstrations and gatherings?" The protest began as students called for “equality of nationalities”, “language freedom”, “respect for truth”, and the “establishment of a new government”, sources told TCHRD quoting local Tibetans in the area. The local armed police, arriving after two hours of the protest, clashed with the students and engaged in indiscriminate beatings. About 20 are injured, among them four are in serious condition. The injured are being treated at the prefectural hospital. TCHRD has also received unconfirmed reports of police using guns to quell the protest. With communication channels to Chabcha now blocked, there is no way to verify this information. However, sources confirm that police threw tear gas shell to disperse the crowds of protesters. At the time of reporting, armed police and military forces have surrounded the school. Parents of the children and other Tibetans are unable to contact the school about the safety and condition of their children. Can repression, always more repression, solve the problem? This reminds me the reaction to the uprising of the Tibetan people in March 1959. The Tibetan 'masses' wanted to protect the Dalai Lama who had been invited to attend a cultural performance in the PLA's cantonment without being accompanied by his regiment of bodyguards. Violating the will of the Tibetan people and betraying the motherland, the Tibetan Local Government and the upper-strata reactionary clique colluded with imperialism assembled rebellious bandits and launched armed attacks against the PLA Garrison in Lhasa during the night of March 19. Acting on orders to put the rebellion down, the valiant units of the PLA stationed in Tibet completely smashed the rebellious bandits in the city of Lhasa on the 22nd. Now the units of the PLA, assisted by patriotic people of all sections, both religions and secular, are mopping up the rebellious bandits in other places, in Tibet. 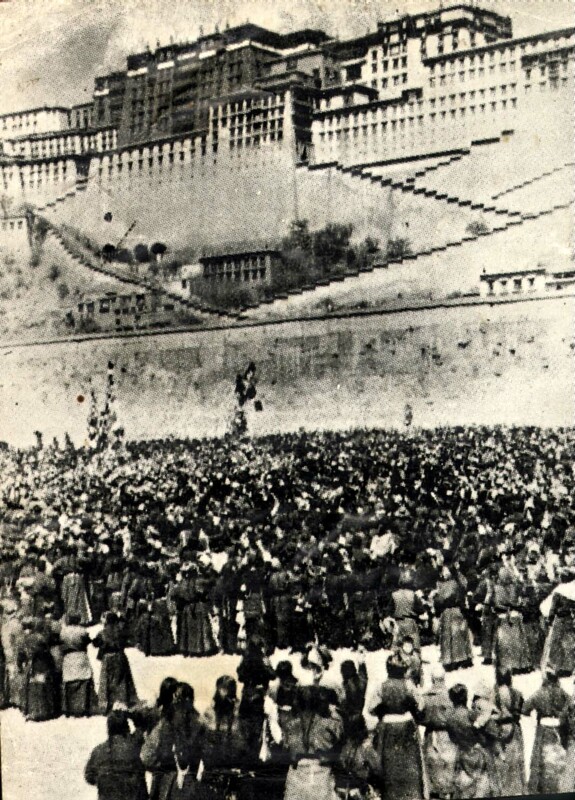 thoroughly, proclaimed that from that day the Tibetan Local Government which had instigated the rebellion was to be dissolved and the Preparatory Committee for the Tibet Autonomous Region should exercise the functions and powers of the Tibetan Local Government. Xi Jinping's China needs to live in the 21st century. Suppression of freedom and repression does not belong to this century. In any case, it has not worked during the 20th. The Times of India reported that A.K. Antony, the Indian Defense minister had urged the Army to go on a 'fast-track' for the "China border projects". The daily stated that 'in view of the current security scenario', the minister reviewed the development of new infrastructure including airfields along the China border in the northeast. A K Antony asked the military top brass to go beyond the expected schedules for completion of the projects. The meeting to review infrastructure development on the northeast border was attended by the Chiefs of the Army and IAF, the Defence Secretary, the chief of BRO (Border Roads Organisation) and other senior officials, . In the meantime China is furthering its advance in other domains. Three drones of different types conducted their final test on November 21, 2012 in Hoh Xil, a high-altitude and frigid area in west China's Qinghai province [Amdo province of Tibet] which marked the full completion of the one-month-long flight tests for the 'Applicability study on drone patrolling-and-inspection in high-altitude area' at altitudes between 2,800 and 4,767 meters above sea level. The drone patrolling-and-inspection flight in high-altitude area is a worldwide problem. The researchers have successively carried out the applicability study on high-altitude patrolling-and-inspection by unmanned helicopters and unmanned fixed-wing airplanes as well as the impact study on drone patrolling-and-inspection under high-altitude weather conditions such as low temperature and sandy wind since March 8, 2012. The researchers conducted tests for a total of 10 types of unmanned plane platforms with different power, different aerodynamic structure and different taking-off and landing mode in such places in Qinghai province as Wushaoling, Jinyintan, Qinghai Lake, Riyue Mountain, Laji Mountain, Xidatan and Hoh Xil respectively since the end of October in 2012. “The government is attaching greater importance to ocean intelligence gathering as the islands disputes heat up,” Huang said. He declined to give an exact sales forecast. The company also makes missiles and parts for China’s space program. CASIC showcased six civilian and military drones at the Zhuhai show, and unveiled a new brand name, Hiwing, which means Sea Hawker in Chinese. Its UAVs can fly as fast as 700 kilometers per hour (435 miles per hour) and carry as much as 130 kilograms (287 pounds). The company sold several dozen UAVs in the past few years, with prices ranging from less than 1 million yuan ($160,000) to about 10 million yuan, Huang said. 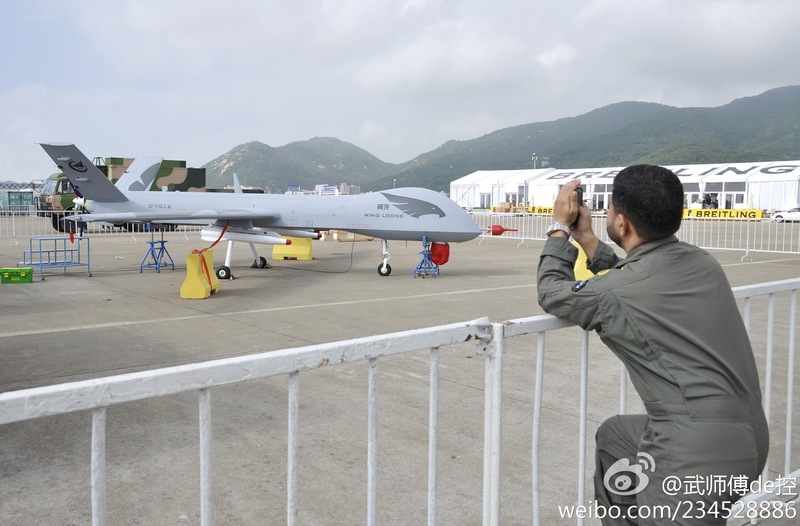 The local non-military UAV market may eventually grow to as big as several billion yuan a year, he said. He didn’t give an estimate for defense sales. The China drone market is not big, but it’s starting an upward cycle,” Huang said. The company also announced an order from a government surveying agency at the show. The dispute over East China Sea islands caused China’s relations with Japan to reach their lowest since at least 2005 in September. Demonstrators marched in cities across China and attacked Japanese businesses after Japan’s government bought the islands from a private owner. The Communist regime mouthpiece said: "An unmanned Chinese military drone recently completed its first digital mapping mission near north China's Helan mountain, capturing high-definition imaging data during more than five consecutive hours of aerial photography." 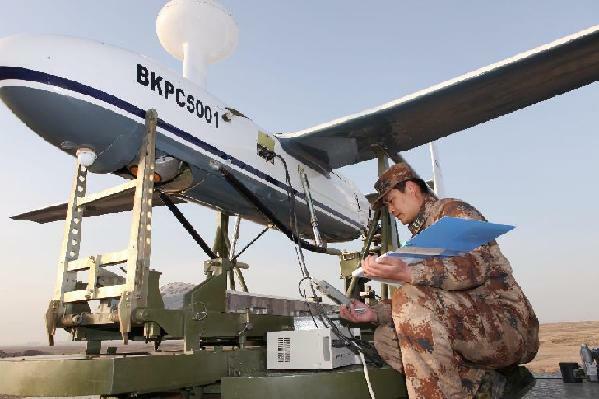 Conducted by the Lanzhou Military Area Command of the Chinese People's Liberation Army (PLA), the mission marked the first time for such type of unmanned drone to be used for military mapping purposes, military sources said Wednesday. The success of the mission marks the Chinese military's creation of a drone-based emergency mapping support mechanism in north China, said Zhang Zhiyuan, the mission's field commander. The unmanned Chinese military drone recently completed its first digital mapping mission near north China's Helan mountain [Alashan Mountains in Mongolian], capturing high-definition imaging data during more than five consecutive hours of aerial photography. Western Tibet (Ngari Prefecture), on the Himachal/Ladakh border also comes under the Lanzhou Military Region. And I do not mention that China has successfully conducted flight landing on its first aircraft carrier, the Liaoning. A new J-15 fighter jet was used as part of the landing exercise. In the meantime, DRDO is building revolutionary eco-friendly toilets. It is time for India to wake up. The Arunachal Pradesh Gaon Bura Association (village headmen) has requested the King of Bhutan to complete a portion of the road linking Tawang district of Arunachal to the Dragon Kingdom. That would be a welcome development. Tawang area and Eastern Bhutan have always had friendly cultural contacts. Had not the ancestors of the 'Monpa' Dalai Lama, Tsangyang Gyatso (1683-1742) migrated from Bhutan? One question was bothering the Government in Delhi: where is the frontier between Tashigang’s district of Bhutan and the Balipara Frontier Tract? The question came for discussion in 1933 and two years later, it was finally agreed between the two Governments that a joint team of officers would inspect the ground. This gave the pretext for the first visit to Tawang by a British officer after the 1914 border Agreement. 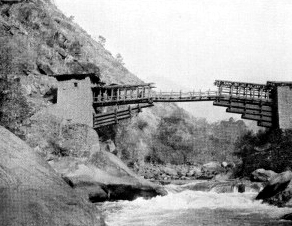 Captain G. Lightfoot, the Political Officer in Balipara spent five days in Tawang (from April 10 to 14, 1936); he also visited Lumla where the negotiations with the Bhutanese took place. The settlement of the Central Monpa boundary was eventually successfully concluded. 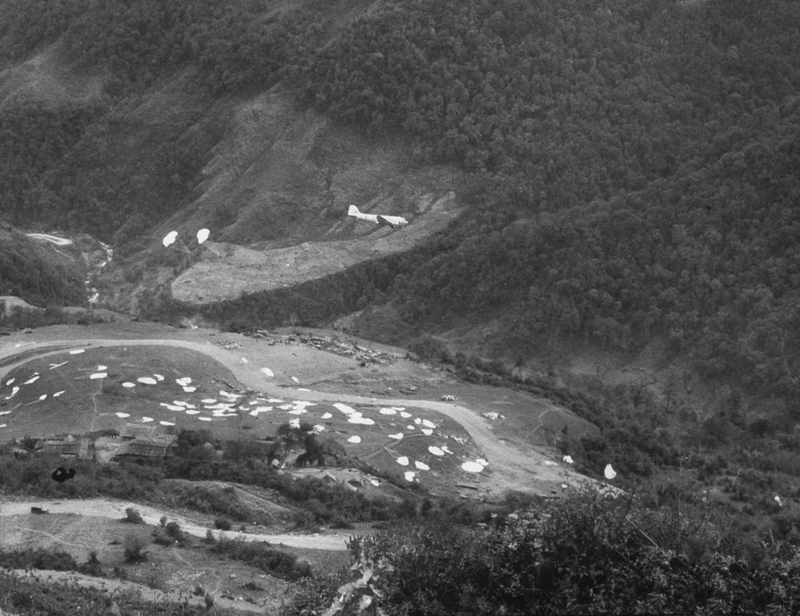 Lightfoot did not have at that time any special orders from his government to look into the presence of the Tibetan administration in the area. Lightfoot’s report dealt mainly with the question of the boundary with Bhutan. The presence of the Tibetans was however mentioned. On his return there was an immediate reaction from the Assam Government. He also informs us that of the Rs. 5,000 posa [tribute], Rs. 1,122 is sent by the Tawang Monastery to Lhasa where the amount is paid to Drepung Monastery and Rs.522 retained by the Tibetan Government. The balance of Rs. 3,878 is divided among the Dzongpons of Tawang and Tsona Dzongs. 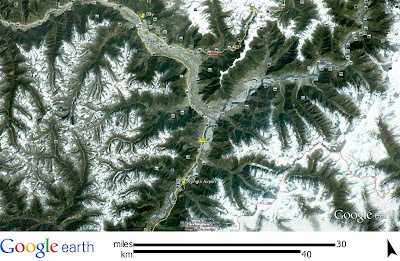 The location of the Bhutan-Tawang boundary was subsequently entered on the Survey of India quarter-inch sheet maps. The simple fact of discussing the border with Bhutan, west of Tawang was a proof that the British had decided to reassert their rights accrued from the 1914 Agreement. Lightfoot also took the opportunity to inform the local representative of the Tsona Dzongpons that the area was Indian and the Monpas were British citizens. We reached Trashigong [Tashigang] on the 2nd March  and were received with great hospitality by our good friend the Dzongpon whom we had met in 1934. In his early days he had been a mendicant monk, and had travelled extensively in Bhutan and Tibet. Then, abandoning his vagabond life, he had settled in eastern Bhutan where his administrative ability was soon recognized, and he became governor of an important frontier district. At Trashigong we received a present of two maunds of fresh butter from His Highness the Maharaja, and one of a maund from the Dzongpon, so we did not suffer from a deficiency of fats in our diet. This supply lasted for many months, and never became rancid. We were informed that no preservative was used in its preparation, that it was washed thoroughly, and that it would keep fresh until we had finished it. We were skeptical, but fresh it remained. Why, I cannot explain. Lumsden had many patients during the three days we spent at Trashigong. Goitre was very prevalent, also leprosy, and there were several cases of cataract. ...We returned to Trashigong on the 18th March and left the following day for the valley of the Nyam Jang Chu. A steep descent of a thousand feet brought us to a fine chain suspension bridge over the Dangme Chu, or Manas river. This bridge is approximately 200 feet long, 6 feet broad, and hangs 50 feet above the river. The footway and sides are of bamboo matting to permit the passage of animals such as ponies and cattle. The iron links of the chains are a foot in length, and the chains themselves are attached to wooden blocks built into masonry piers at either end. This is the only chain suspension bridge I have ever seen in Bhutan, but there are several in Tibet. There is one, for instance, over the Tawang Chu; a second spans the Sutlej at Toling; and in former days a third bridged the mighty Tsangpo at Chaksam near Lhasa. Who forged the iron links of these chains? The answer to this question I have never discovered. The local inhabitants are entirely ignorant of their history. More recently a problem cropped up about the border between Bhutan and Tawang district. Bhutanese officials visited Tawang in order to get a road rectified; according to the Tashigang's Dzongda (DC) it encroached on Bhutan's territory. District officials in the neighbouring Indian state of Arunachal Pradesh have agreed to rectify the road construction that has encroached Bhutanese soil in Dongshingma, Yalang gewog, Trashiyangtse district administration officials say. Trashiyangtse dzongda Sangay Duba and gewog officials from Yalang and Toedhtsho visited Tawang, the capital of Arunachal Pradesh [sic], a few weeks ago, where the agreement was reached. The international boundary office in Thimphu earlier reported that a road construction from the Indian side had entered Bhutanese soil by around 10m. “When a team from Toedtsho and Yalang gewogs visited local officials in Bongling to resolve the issue, our team was told the issue be taken up with Tawang,” Toedtsho gewog officials said. The team was also told by locals that the encroachment was accidental. They reasoned contractor’s discrepancy during construction as the cause for encroachment. The team also learnt that the deputy commissioner (DC) in Tawang wasn’t even aware of the encroachment. The letter, the dzongkhag administration had written and sent more than a month ago, had not reached Tawang. Tawang has also been informed to apprise its people to refrain from entering other parts of Bhutan via Trashiyangtse without possession of valid immigration documents. Toedtsho gup Dechen Wangdi said that people from Tawang would not be allowed to travel beyond Chazam in Trashigang without valid documents. This was to prevent Tawangpas from getting stranded in Bhutan. Tawangpas, wishing to travel to other parts of Bhutan, can enter only from designated entry points in Samdrupjongkhar and Phuentsholing. Meanwhile, dzongkhag officials said that no border disputes have been reported from Bumdeling, which shares a border with China. “Our people are monitoring the boundary pillar and, according to their report, everything is fine,” Sangay Duba said. The international boundary office is also following up on a missing border pillar KT-2, between Buri in Tawang and Jangphutse under Teodtsho gewog in Trashiyangtse. Let us hope that the King of Bhutan will agree to the request from the Arunachal Government and the village headmen. It could help dis-enclave Tawang district which today depends of the road presently widened by the Border Road Organization. Lumla, Nov 22 (ANI): The Tawang unit of the powerful Arunachal Pradesh Gaon Bura Association has urged the King of Bhutan to give permission to build the Bhutan portion of the Lumla-Tashigang Road. The demand comes even as the Arunachal Pradesh Government led by Chief Minister Nabam Tuki has taken the initiative to construct the Lumla-Tashigang Road. The Indian government of late has shown keen interest to build the Lumla-Tashigang Road to reduce the distance between Tawang, which houses the world-famous Tawang Monastery, and Guwahati, the gateway to North East India, by about 200 km and travel time by almost six hours. Currently, it takes around 15 hours to travel from Tawang to Guwahati via Bhalukpong and Tezpur, a distance of about 600 km. The road is not fair-weather because of Sela pass located at an altitude of 13,700 feet while the 400 km Tawang-Lumla-Tashigang would be a laissez-faire road and help reopen the age-old traditional border trade between the people of Bhutan and Tawang district. The district GBs led by president Kota Lama, in a memorandum, has pleaded with the Bhutan King for permission to rebuilding of hardly 10 km road which would complete the road. Pointing out that the people of Bhutan and the Monpas of Tawang district have the same religion, culture and traditions, the GBs said that since olden days the people of Tawang used to visit religious places, like Gombay Kora, Durang Chorten, Gonja Ney, Tango Ney, Thimpu Dzongkha etc. in Bhutan while the Bhutanese used to visit for pilgrimage to Tawang Monastery, Gorsam Chorten, Zangdopari Gompa, Taksang Gompa, Urgelling Gompa, Khinmay Gompa, Lhu-gyepu Phobrang (Muktur), Thongmin Gompa, Manma-Gyalam Ney, Thanga-Fe Ney, Banga Jang Ney, Sarong Gompa, Changbu Gompa, Gomshin Ney etc with great difficulties by undertaking foot march for days together. It said road connectivity would facilitate easy movement of people from both the countries. The opening of Lumla-Tashigang road would also be useful for the Indian Army guarding the border, said Tawang District Seva Dal chief organizer Lobsang Dawa, while appreciating the CM for his assurance on reopening of the road soon in his address during the recent Tawang festival in presence of AICC general secretary Rahul Gandhi. The proposed STOL (Short take off a and landing) airport at Lumla would be a boon for security of the nation as Lumla's weather remains conducive for air operation, commented Lumla circle anchal chairperson Lobsang Yonten. Yonten's comment supports the recent statement of Air Chief Marshal Norman Anil Kumar Browne that the outcome of 1962 Chinese aggression would have been different had India used air power. A few days before the beginning of the CCP's 18th Congress, I mentioned on this blog that Xinhua had reported that Jia Qinglin, the then No 4 in the Standing Committee of the Politburo and Chairman of the National Committee of the Chinese People's Political Consultative Conference called "for greater development in China's ethnic Tibetan regions, as well as more efforts to fight the Dalai Lama clique, in order to ensure the regions' lasting stability." Jia had then told a press conference that "Tibet-related issues are of paramount importance for the Communist Party of China and the country"
Adding: "stability and development should be stressed in Tibetan regions." Xinhua explained that "China's Tibetan regions include the Tibet autonomous region and parts of the Qinghai, Gansu, Sichuan and Yunnan provinces." The outgoing member of the Standing Committee of the Politburo had further stated: "Tibetan regions are at a key stage of development, adding that Tibetans' livelihoods should be improved and the regions' ecological protection should be emphasized." What was not mentioned was that the Central Working Coordination Small Group on Tibet (or Leading Small Group) had a meeting before the Congress. What is a 'leading small group' or LSG? According to Wikipedia it is "an ad hoc supra-ministerial coordinating and consulting body formed to build consensus on issues that cut across the government, party, and military systems when the existing bureaucratic structure is unable to do so. The authorization for the formation of leading groups comes from Chapter IX of the Constitution of the Communist Party of China." The online encyclopedia adds: "These groups provide a mechanism for top decision-makers to exchange views – both formally and informally – and to develop recommendations for the Politburo and the State Council. LSGs do not formulate concrete policies, but rather issue guiding principles about the general direction in which bureaucratic activity should move. ...Leading small groups have become increasingly important within the PRC after the 1990s, especially in the field of foreign policy where the LSGs have become a tool for coordinating the work of several agencies as well as insuring party supervision over government activities." The job of the Small Group on Tibet is to implement the policies of the 5th Tibet Work Forum. It now appears that the Group had a meeting on October 18, under the Chairmanship of Jia Qinglin. It was attended amongst others by Ma Kai, Meng Jianzhu, Ling Jihua, and Du Qinglin and 'local' officials. At that time, Ma, Meng and Du were the Vice Chairmen of the Small Group. After the 18th Party Congress' leadership change, all these leaders have secured good jobs. Ma Kai and Meng Jianzhu are part of the Politburo, (Meng will take the mantle of Zhang Yongkang as the boss of the Security apparatus). Du Qinglin shifts from the United Front Work Department to the Party Central Secretariat while Ling Jihua takes Du's seat in the United Front. Though the Group has to be officially reconstituted, it is the officials who will probably continue to influence China's Tibet policy. This explains that no improvement can soon be expected in Tibet and the new guidelines mentioned below is another proof that the reconciliation path is still far away in the Middle Kingdom. The Dalai Lama's Middle Path seems to be further away. However let us see who will replace Jia as the leader responsible for the 'minorities' affairs', in the Politburo's Standing Committee. In the meantime, one more Tibetan self-immolated yesterday in Qinghai Province (Amdo). According to Xinhua, Libong Tsering, 19, set himself ablaze in Dowa township of Tongren county in the Huangnan Tibetan Autonomous Prefecture. Libong is the 80th Tibetan to commit suicide in such horrible way. 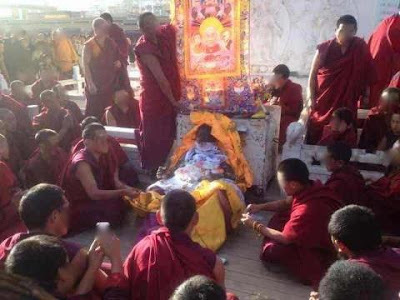 The Chinese authorities in Malho (Chinese: Huangnan) Tibetan Autonomous Prefecture in Qinghai Province have announced the cancellation of government aid to families of self-immolators as well as development projects in villages where Tibetans had carried out protest self-immolations. In the past three weeks, nine Tibetans have died of protest self-immolations in Rebkong County. On 9 November, about 5000 Tibetan schoolchildren held a peaceful protest march against the alarming official apathy towards rising numbers of protest self-immolation in Rongwo town before gathering at Rongwo Monastery. [i] On 8 November, Tibetan schoolchildren in Dowa Township (Rebkong County) took down Chinese flags from their school building and the Township government office building. In an official notification issued on 14 November by the Malho Prefectural office and Malho People’s government, local Party and government officials have been sternly given orders to punish self-immolators and their families; even those who had offered condolences and prayers to the bereaved family members and relatives. A source told TCHRD that the notification, issued both in Tibetan and Chinese, was shown on Malho Prefectural TV channel. Only the Tibetan version is available with TCHRD. The first point in the notification clearly states that government aid to the family members of a person who had self-immolated will be cut off for three years. In this regard, all prefectural government offices and related sections and staff have been ordered to act strictly. No one is allowed to arrange for the resumption of government aids to such families. Development funds will be cancelled to those villages where self-immolations took place; even those projects that had been approved earlier will be cancelled within three years. In areas where these self-immolations took place, the County Committee of the Communist Party of China (CPC) will carry out detailed investigation into the failure of Township or Village leaders and relevant Party officials to protect “stability” and “harmony”. If found responsible, these Township, Village and Party leaders will be investigated thoroughly and they will not be considered for any model worker prizes by the government in future. They will be relieved of their posts and new recruits shall be made in their place. The notification also said severe measures will be taken, according to rules and regulations of the Party and the government, against guilty officials for their inability to implement orders from the Party and the government. The second point calls for thorough investigation to determine whether any government officials and staff had visited the homes of self-immolators to offer condolences or contributions for prayer ceremonies. Officials of the County and Township government as well as the CPC Committee should advise and guide these officials on the implication of such visits. The Public Security Bureau officers will “strike hard” on those who do not listen to such guidance. The third point asks relevant government and Party officials to give advice and guidance to monks and lay Tibetans on the consequences of visiting homes of self-immolators to offer condolences and contributions for prayer rituals. If members of the Monastery Management Committees (MMCs) are found guilty in this respect, officials from the United Front Work Department, Religious Affairs Bureau and related government bureaus will handle these cases and punish them accordingly. If a village or a monastery has collectively organized prayer ceremonies and visits to the families of self-immolator, then the whole village will get no government aid. All development projects approved earlier in the village will be cancelled within three years. The fourth point calls for a quick and thorough investigation to see whether any person, both monks and lay, had arranged and forced some officials to visit the prayer ceremonies for self-immolators. The guilty will be punished, according to the law, after detailed investigation. If village leaders are found involved in such acts, they will be relieved of their position and will be interrogated and investigated. If high lamas [or abbots] and members of Democratic Management Committees are found involved in such acts, the notification says their monasteries will be closed following the relevant laws and required steps would be taken to purge these monasteries of instability. Heavy punishment shall be given to those who attempt to organize themselves or form associations or groups. The fifth point warns the average government cadres and workers from visiting homes of self-immolators and offering contributions for prayer rituals, the offence of which will attract immediate firing, followed by investigations and punishments. The government cadres and workers have been ordered to publicise the importance of the implementation of the measures listed in this notification. They are required to inform the Party and government offices in timely manner if they get any information about the matters listed in the notification. In its introduction, the notification mentions continued incidents of instability in Malho Prefecture calling them a bad example for everyone, harming not only the stability of Gansu Province, but also that of the whole nation. As is usual in many of Chinese government pronouncements, the so-called “Dalai clique”, has been held responsible for instability in the region. “The Dalai clique, wearing religious robes, use self-immolations to create instability,” it said, adding, they are also responsible for inciting schoolchildren to create disturbances and instability. The notice expressed disapproval against the use of the word “martyr” by the “Dalai clique” to describe self-immolators. The same old thing in Tibet? A relatively large contingent of Communist leaders posted in Tibet have made it to CCP's Central Committee (CC) (full-fledged or alternate). Nobody, of course, was promoted in the Politburo, though eight leaders posted in Tibet are now members of the Central Committee. More interesting Lt. General Yang Jinshan, the PLA Commander of the Tibet Military District has been promoted to Full CC membership, while Gongbo Tashi, the head of the TAR United Front Department was promoted Alternate CC member. However, Jampa Phuntsok (Qiangba Puncog), former Chairman of the government of Tibet Autonomous Region from 2003 until January 2010 and later Chairman of the Standing Committee of the People's Congress of the Tibet Autonomous Region is out (retired). 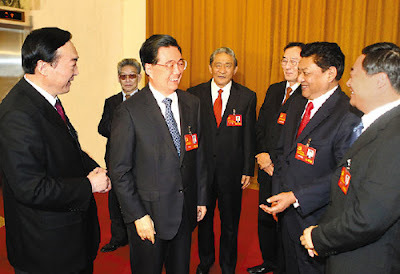 It has also to be noted that Zhu Weiqun, the Executive Deputy Minister of the United Front, who in the past handled day to day Tibetan affairs is not a member of the CC anymore. Tibetan hardliner Ragdi, who has no official position any longer escorted Hu Jintao into the Great Hall of the People to meet and spend an hour with the TAR delegation after the opening of the 18th Congress. 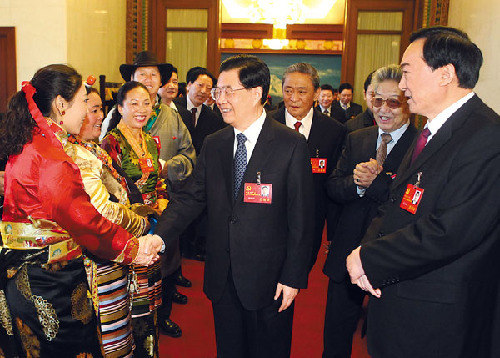 Hu Jintao will probably keep a finger in the Tibetan pie through his protege Ling Jihua, the new boss of the United Front Work Department. Though Ling did not make it to the Standing Committee of the Politburo (due to his son's Ferrari accident, he was found found naked and probably dead with 2 'ethnic' girls), Ling remains a powerful force. 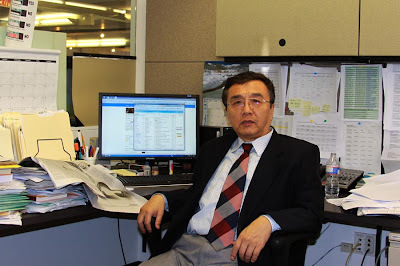 Du Qinglin, the former Director of the United Front has switched place with Ling in the Secretariat of Central Committee. Tibet policy is not going to change soon. Regarding the Central Military Commission (CMC), the passing of power was apparently smooth, but no 'Tibet' experts seem to be amongst the 10 uniformed members. However, the strengethning of the Air Force with the appointment of General Xu Qiliang, the former PLA Air Force Chief as Vice-Chairman of the CMC may provide new 'air' opportunities for the Chinese defense forces in case of a conflict with India. Xi Jinping has shown the world that he is now in charge of the People's Liberation Army - chairing a special meeting of the Communist Party's Central Military Commission (CMC) a day after being put in charge. And President Hu Jintao, who on Thursday passed the chairmanship of the body that controls the PLA, along with the leadership of the Communist Party, gave his ringing endorsement to his successor at Friday's meeting. The incoming and outgoing top brass were all present. Hu told the special meeting that Xi was "a competent party general secretary and CMC chairman", and highlighted his successor's experience. "Comrade Xi Jinping can, for sure, shoulder the great responsibility of being chairman of the Central Military Commission, and uniting and leading the commission to fulfil great and historic missions," state media quoted Hu as saying yesterday. Xi told his audience that Hu's own decision to step down as CMC chairman with immediate effect had "shown his foresight as a Marxist statesman and strategist, and his broad mind and noble character". Hu's predecessor Jiang Zemin remained chairman of the military commission for two more years after handing over the post of party chief in 2002. Xu Guangyu, a senior researcher at the China Arms Control and Disarmament Association in Beijing, said: "[Hu and Xi] were telling all retired leaders not to cling to power any more and to trust the next generation of leaders." The speech also marked another major departure from the past. When Hu inherited the top military post from Jiang in 2004, he stressed in his inaugural speech that under the PLA's "political principle" it "would make no promise to give up the use of force" to secure reunification with Taiwan. Eight years later, Xi's inaugural address sidestepped the Taiwan issue completely. "Cross-strait relations have improved since Ma Ying-jeou came to power in 2008 - it's unnecessary to mention such a sensitive issue to provoke Taiwanese compatriots," Xu said, adding that Xi had spent 17 years in Fujian , just across the strait from Taiwan, and was clearly confident on the subject. "Xi also realised that the real knotty problem now is in the East and South China seas, which need both Beijing and Taipei to work together to defend our national sovereignty," Xu said, referring to territorial disputes over various islands. Taipei-based political commentator Lin Baohua, also known as Ling Feng, said Xi also wanted to show Japan and the US that he would continue to use economic means to solve the Taiwan problem. "Xi realises that if he uses military force to liberate Taiwan, the cost would be much higher than the use of economic forces," he said. Hu and Xi also reiterated the army's absolute loyalty to the party. Xi made it clear senior officers should set examples for troops in anti-corruption campaigns. While the delegates of the CCP's 18th Congress are busy selecting their next leaders and the foreign media speculates on who will be the new Emperors of China, the infrastructure development continues at a quick pace in Tibet; it moves towards the Indian border. According to China Daily, Jampa Phuntsok (alias Qiangba Puncog for the Chinese), the Chairman of the Standing Committee of the Tibet People's Congress and Padma Choling, the Chairman of the Tibetan Autonomous Region gave a press conference on the side of the Congress to boast about the new railway line to Shigatse which will later be extended to Nyingchi, north of the McMahon Line. The railway linking Lhasa and Shigatse in southwest China's Tibet Autonomous Region is under construction as an extension line of the Qinghai-Tibet Railway. The construction started in 2010 with a total investment of 10.8 billion yuan as a key project of the Central Government. The railway runs 253 kilometers with a designed transportation capacity of over 8.3 million tons every year. The construction work is estimated to finish in 2014. Designed with the top national standard, the railway will run at a speed of over 120 km per hour and stop at 13 railway stations including Lhasa South, Quxu, Nyemo and Shigatse. India, busy with different scams and cricket matches, is still half asleep. New railway line among measures to improve flow of passengers, goods in region Construction of a new railway linking Lhasa, capital of Tibet, and Nyingchi prefecture in the region's southeast will start very soon, Padma Choling, chairman of the autonomous region, told a group discussion at the 18th National Congress of the Communist Party of China in Beijing. He did not disclose details of the route or budget for the line. Media reports in April said the 435-km-long Nyingchi-Lhasa Railway is part of the proposed Sichuan-Tibet Railway, linking Chengdu in neighboring Sichuan province and Lhasa. Upon completion, the journey between Lhasa and Nyingchi, which now are linked by car and airplane, will be shortened to less than two hours from the current more than nine hours' drive. The Sichuan-Tibet Railway will be 1,900 km long, with investment of about 130 billion yuan ($20.8 billion) in State funds. 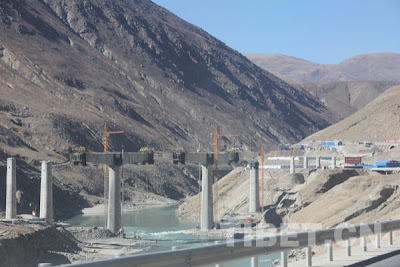 Construction will take six years, according to the Tibet Daily. Construction work will be difficult, having to overcome frozen earth, landslides, rock slides, cold weather and lack of oxygen due to high altitude in some places. On Thursday, a senior Tibetan legislator also said another railway, between Lhasa and Xigaze, will begin operating by the end of 2014. "Construction of the railway has been progressing well despite some geological difficulties," Qiangba Puncog, chairman of the Standing Committee of the Tibet People's Congress, said on the sidelines of the Party congress. The line from Lhasa to Xigaze is the first extension of the world's highest-altitude rail link, the Qinghai-Tibet Railway, which opened in July 2006. Good news have finally been received from Tibet: "the People’s income is increasing, Life is better and better, Security is becoming more and more powerful". It is what this article posted on China Tibet Online says. But if it so, why the hell are people burning themselves all over the plateau? Will this dichotomy be discussed during the 18th Congress in Beijing? There is a mystery there, don't you think? “The key issue in strengthening social construction lies in the insurance and improvement of people’s livelihood. We should bring as much benefit as possible to the people, resolve as many difficulties as possible for them, and solve the most pressing and practical problems of the greatest concern to them. We will intensify efforts to improve the basic public service system and ensure that all the people enjoy their rights to education, employment, medical and old-age care, and housing, so that they will lead a better life.” President Hu Jintao said in a keynote speech at the opening of the CPC's 18th National Congress. Over the past 10 years, along with the rapid economic and social development of Tibet, the regional Party committee and government have given a priority and great attention to people's livelihood. The life of urban and rural residents has undergone earth-shaking changes, including the significantly increased residential income and the fully covered social security system in all Tibetan areas. A beautiful picture has been showed where people are living a happy and peaceful life. On Oct.1, Dawa Tsering opened his new vermicelli fabrication plant in Khesum Village, in Tibet’s Nedong County. In recent years, Dawa Tsering’s life has become better and better. Dawa Tsering began to fabricate the pea meals in 2000, later he and the villagers together raised pigs and grew vegetables. Now, his son buys a car for renting. The total income of his family is nearly 500,000 yuan. “Our life is as good as that of the urban residents.” Dawa Tsering said with a smile. Over the past ten years, the income of Tibetan people like Dawa Tsering is increasing gradually. Statistics show that in 2011, the urban per capita disposable income came to 16,196 yuan and the rural per capita net income reached 4,904 yuan, rising by 8.1% and 18.5% in real terms respectively. 42,881 urban residents received the government minimum living allowance with the relief fund of 112.225mln yuan, while the number of which were 230,000 and 180.6766mln respectively in rural areas. An old Tibetan woman smiles happily. Walking around in Tibetan rural areas, you can feel the modern atmosphere everywhere in spacious and clean streets, fragrant flowers, green and luxuriant trees and the elegant buildings. Now, most of the Tibetan farmers and herdsmen are living in the Affordable Houses with the support of the Party’s preferential policies. Many families have installed telephones. Mobile phones are not fresh news, and even freely galloping cars can be seen in the countryside. Besides the Affordable Houses Project, 320,000 more people could drink safe water, and 210,000 more people have access to electricity. More than 1,900 kilometers rural highways covering 700 villages have been built. The newly built spacious Affordable Houses are filled with the aromas of barley wine and yak butter tea as well as the happy laughter. 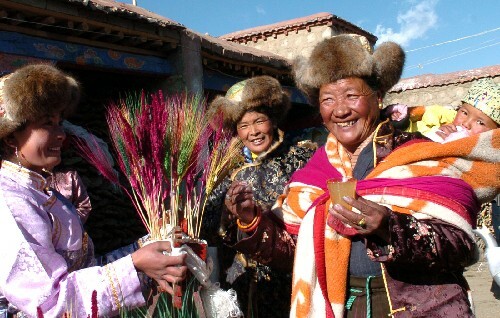 Over the past ten years, the living conditions of the urban and rural residents in Tibet have improved greatly. So far, the Tibetan Affordable Houses Project for farmers and herdsmen has completed investment of 21,927 million yuan, covering 350,500 households. Another 69,500 farmers and herdsmen will live in the affordable houses by the end of this year. 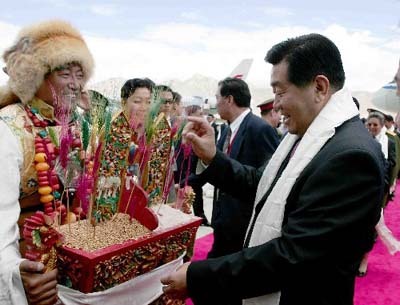 By 2013, all the Tibetan farmers and herdsmen will live in safe and affordable houses. Tsajo, a 49-year-old farmer from Sumpang Township, in Lhundrup County of Lhasa, the capital city of Tibet Autonomous Region is a chronic gastritis sufferer. She jointed in the local medical insurance program in which she only needs to pay 10 yuan per year as medical fund, while 20,000 yuan of hospitalization expense is provided by the government for her every year. All the medical expense provided by the government comes from the special medical fund by the Department of Health. “I needn’t worry about the medical expenses so much as before.” Tsajo said. In 2003, Tibet took lead in establishing the medical system based on free medical treatment in agricultural and pastoral areas, and clearly defined the regulations of the system in terms of the organization and management, fund raising, reimbursement and compensation. By 2009, the medical system had covered all the agricultural and pastoral areas. By the end of 2010, the new rural pension insurance system realized full coverage in rural areas, involving 2.21 million agricultural people. Since last year, Tibet had encircled the senior high school education and medium vocational education to the “Three Guarantee” Policy, concerning food, dormitory and tuition. The benefited students have expanded to more than 500,000 from 27,000 since the new “Three Guarantee” Policy was implemented. The standard of the policy has been raised several times to 2400 ~ 2600 yuan per capita every year. “Three Guarantee” Policy in compulsory education stage has covered all the students from farmers and herdsmen’ families. Over the past ten years, the Tibet local government has launched several policies to help and improve the employment of the graduates, such as increasing public officer positions, buying public welfare posts, and enhancing enterprises’ employment absorption capacities. The opening of the 18th National Congress of the Communist Party once again sends a strong signal to improve people’s livelihood. With the support of central government, the Tibet Party committee and government will implement the policies that have a close relationship with people’s livelihood by all means, so as to improve and guarantee the living standards and conditions of the Tibetan people from all ethnic groups. The Special Frontier Forces, the Tibetan Army (also known as the 22s) is today celebrating the 50th anniversary of its formation. 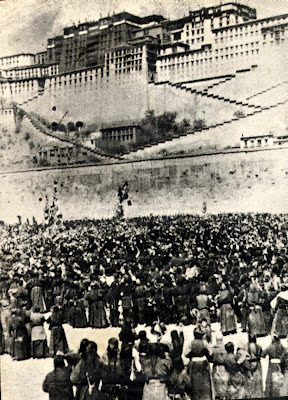 Why to have fixed the formation of the Tibetan Army on October 14? Probably B.N. Mullik, the then Director of the Intelligence Bureau wanted to please Nehru on his birthday by telling him that he 'had found a solution' to China's military superiority. On 14 November, an Indian counterattack in NEFA was soundly routed. Three days later, the entire NEFA line collapsed, giving China virtual control over 64,000 square kilometers of territory. By 19 November, leaders in New Delhi genuinely feared an attack on Calcutta, prompting Nehru to take the extraordinary step of sending two secret back-channel messages to Kennedy pleading for a pair of bomber squadrons flown by U.S. pilots. As a covert aside to Harriman's talks, the CIA representatives on the delegation held their own sessions with Indian intelligence czar Mullik. This was a first, as Galbraith had previously taken great pains to downscale the agency's activities inside India to all but benign reporting functions. As recently as 5 November, he had objected to projected CIA plans due to the risk of exposure. But in a 13 November letter to Kennedy, the ambassador had a qualified change of heart, noting that Menon's departure was a turning point to begin working with the Indians on 'sensitive matters'. I post below an article I wrote for Rediff.com on January 08, 2003 on the 'The Phantoms of Chittagong', the Special Frontier Forces of Maj. Gen. SS Uban, based at Chakrata in Uttarakhand. I had earlier published on this blog, an excellent article of Manas Paul (Phantom Warriors of 1971: Unsung Tibetan Guerrillas). So did Major General SS Uban, the Indian general who founded the SFF (his designation was inspector general). Though he wrote his memoir The Phantoms of Chittagong, he only obliquely refers to his troops as Tibetans. In another book on the 1971 operations, the present governor of Punjab, Lieutenant General J F R Jacob, then chief of staff, Eastern Command, does not say anything about the Tibetan prowess. My article Declassified history: Documents on The War With China appeared in The Statesman in Sunday. 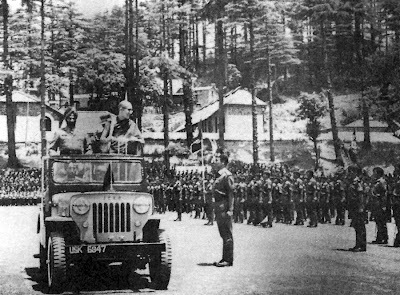 WHILE China chose to remain quiet, the 1962 Sino-Indian war which has left such a deep scar on Indian psyche, received extensive coverage in India. The international press more or less ignored the issue; it is a fact that outside India, very few cared for what happened fifty years ago on the Himalayan slopes. For example, I have not seen a single article in the French press about the 1962 war. however, the Cuban missile crisis between the United States and the Soviet Union which occurred at the same time, has been widely discussed in the world media and amongst historians. Further difference between the two conflicts is the number of new documents which have been declassified by the US, the Russians and other protagonists of the Cuban crisis while in India and China, the archives have remained as hermetically closed as ever. This is not a sign of maturity for the two ‘emerging’ nations. It has not been the case in the US and Russia; take the example of the National Security Archives of the George Washington University which has posted a large number of newly declassified documents about the role of submarines in the Cuban conflict. On 27 October 1962, the most dangerous day of the crisis, the confrontation between the US Navy sub-chasing units and the B-59 Soviet submarines was described in great detail on TV shows. Declassified documents include the original Soviet Navy map of the Caribbean showing the locations of the four ‘Foxtrot’ diesel submarines which on 1 October 1962, had left their Murmansk base, north of the Arctic Circle, to sail towards Cuba. One realises now that the US Navy did not know that the Soviet subs were loaded with a nuclear-tipped torpedo and oral instructions were given to the Soviet captains to use them if attacked by the Americans. The documents include a till now unknown after-action report prepared by Soviet Northern Fleet Headquarters when the subs’ commanders returned to Murmansk in November 1962; it describes the dreadful conditions aboard the submarines, extreme temperatures, equipment breakdowns, and the reckless deployment of nuclear torpedoes aboard Soviet submarines. The subs were just not designed for tropical waters. There is another report, 12 years older than the HBR which is also missing in action. It is the Himmatsinghji report, prepared after China’s invasion of Tibet in October 1950. It seems to have been misplaced by the Ministry of Defence. Can you believe it? All missing in action! While other countries declassify, India loses its reports! Does it mean that the Himmatsinghji Committee Report is lost forever? Does the Report really exonerate the political bosses? Probably not. In the meantime, China still pretends that it was attacked by India. Though there was no question of the Indian Army ‘attacking China’ with no food, no warm clothes, no armament or ammunition supply, the Chinese seemed to have perceived the situation differently. A detail gives a hint to one of the real political blunders of 1962. In his memoirs, Maj. Gen. Niranjan Prasad, the 4 Division’s Commander describes the setting: “The McMahon Line as drawn by Sir Henry McMahon in 1914 on an unsurveyed map, was not an accurate projection of the Himalayan watershed line. …In this process the position of Thagla ridge was, to say the least, left ambiguous.” The survey had been completed in 1913 by Captain Bailey, but it was rather sketchy (1 inch to 8 miles). Did this incertitude on the exact location of the border lead to the war? It is what the Chinese say, though the fact that the Chinese attacked simultaneously in all sectors (Tawang, Walong in NEFA and Ladakh) is proof that the operations had been prepared well in advance by the Communist regime in Beijing; it did not really even need a pretext. But is it a valid reason to hold back declassification of 50-year-old historical documents related to the conflict? 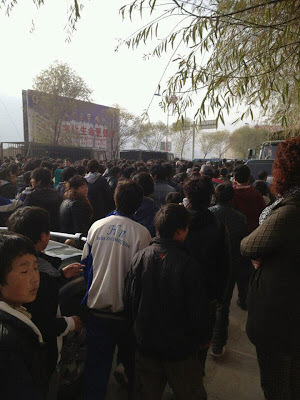 According to the Tibetan Centre for Human Rights and Democracy in Dharamsala, several thousands Tibetans demonstrated in Rebkong County of Malho Tibetan Autonomous Prefecture in Qinghai Province (formerly Amdo). Who could have envisaged this only a year ago? Not the China's watchers, for sure. President Xi Jinping has a tough road ahead. Will he be a new Hu Yaobang and bring some appeasement to these areas which have for so long suffered of the Great Han Chauvinism? 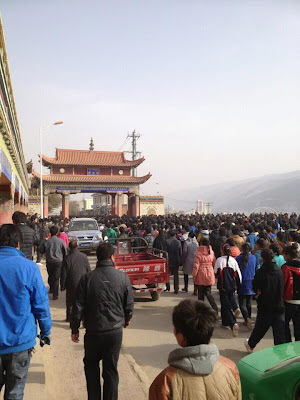 Thousands of Tibetan school children staged a protest march early today in Rebkong (Ch: Tongren) County where three Tibetans burned themselves alive in the past five days in Malho (Ch: Huangnan) Tibetan Autonomous Prefecture in Qinghai Province, in the Tibetan province of Amdo. This is the second protest reported from Rebkong County after yesterday’s protest in which about 700 schoolchildren pulled down the five-starred Chinese flags hoisted on top of their school building in Dowa Township. Chinese flags on Dowa Township government office were also pulled down. 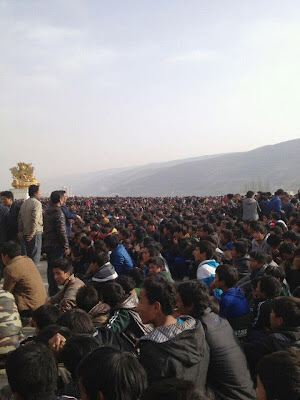 According to information received by TCHRD, about 5,000 students from different schools in Malho Prefecture and Rebkong County organized a demonstration at around 5 am (local time) today reciting prayers in honour of the Dalai Lama and shouting slogans for ‘equality of nationalities’, ‘free Tibet’, and ‘return of Dalai Lama to Tibet’. Students participating in the demonstration hail from four major counties of Thunding, Chentsa (Ch: Jiancha), Tsekhog (Ch: Zeku) and Yulgan (Ch: Henan) in Malho Prefecture, according to sources. The demonstrators walked across Rongwo town before assembling at Dolma Square in front of Rongwo Monastery. At the square, they kept on reciting prayers and shouting slogans even as more local Tibetans joined the crowd. Sources told TCHRD that the demonstration at Dolma Square is gaining strength with more joining in. The streets in and around Rongwo are filled with school children causing intermittent halts in traffic movement. There are no reports of official clampdown on the demonstration but People’s Armed Police are stationed at various road checkpoints and at the government offices in the County. Yesterday, on the morning of 8 November, about 700 schoolchildren pulled down Chinese flags from a school building and township government office in Dowa Township. Moments after the protest, seven military trucks came from Rebkong County but local Tibetans and school children stopped the trucks from moving to Dowa Township. Faced with a crowd of Tibetan protesters, the military trucks backed off returning to Rebkong. In the past five days, three Tibetans have set themselves ablaze in Rebkong County. 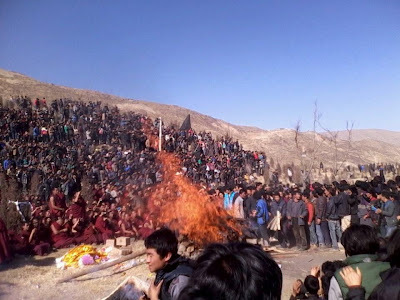 On 8 November, Kalsang Jinpa, 18, a nomad burned himself to death in protest near Rongwo Monastery. Jinpa had been a monk at Rongwo Monastery. According to sources with contacts in the region, Jinpa died calling for the return of the Dalai Lama to Tibet. The day before, on 7 November, Tamding Tso, 23, mother of a six-year-old boy set herself on fire and died calling for the return of the Dalai Lama to Tibet. Tamding Tso belonged to Dro Rongwo Village in Dowa Township. Earlier on 4 November, Dorjee Lhundup, a farmer in his mid-20s and father of a two-year-old girl and a four-year-old son died of self-immolation protest calling for the return of the Dalai Lama to Tibet.